Botulism is one of the most fatal diseases in all over the world. However, it is rare, and caused by a nerve toxin which is produced by the bacterium Clostridium botulinum(C. botulinum) and sometimes by strains of Clostridium butyricum and Clostridium baratii (3). There are five main kinds of botulism, which are foodborne botulism, wound botulism, infant botulism, adault intestinal toxaemia botulism and iatrogenic botulism (3). Foodborne botulism has been caused by eating foods that contain the C. botulinum toxin. C. botulinum is the name of a group of bacteria which can be found in soil, dust and river or sea sediments (8). These rod-shaped organisms grow best in low oxygen conditions, so the bacterium itself is not harmful (3). However, it can produce highly poisonous toxins when the poverty of oxygen, such as in closed cans or bottles, stagnant soil or mud, or sometimes the human body (8). The bacteria spores which allow them to survive in a dormant state until exposed to conditions that can support their growth. There are seven types of botulinum toxin which is produced by C. botulinum, and indicated by the letters A through G. Only types A, B, E and F are poisonous to humans, and type F is the most toxic and type B is the least toxic (8). The source of foodborne botulism has been frequently home-canned foods that are low in acid, for example, green beans, beets, cured pork and ham, smoked or raw fish and honey or corn syrup (9). Even tiny amounts of this toxin can lead to severe poisoning when food contaminated with the toxin is eaten. 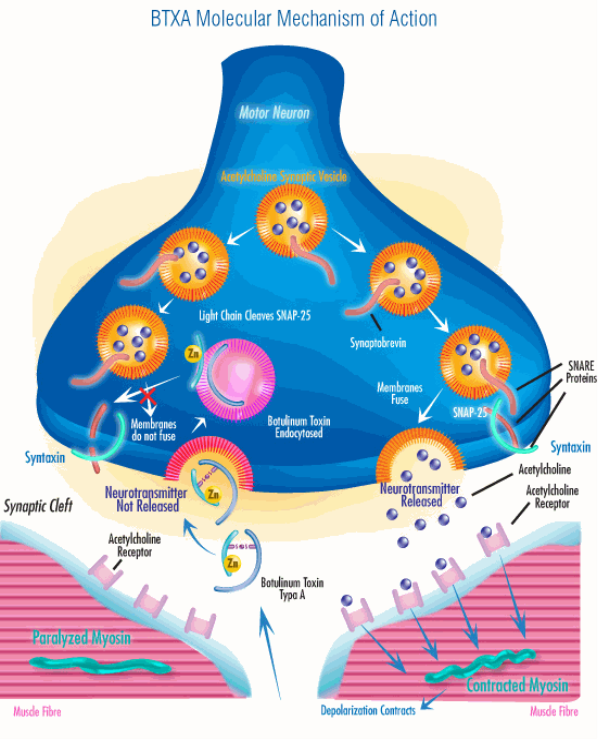 The visuals above show the description of how the Botulinum Toxin Type A works inside of the synaptic cleft. It blocks nerve activity and causing paralysis (13). Through the transmission of the nerve, muscle is contracted by receiving signal from neurotransmitter. 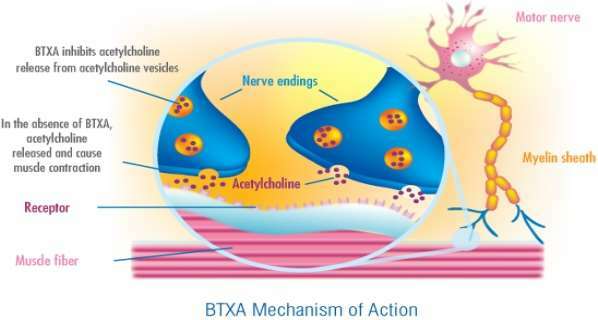 Acetylcholine is one of these neurotransmitters and Botulinum Toxin Type A actions by inhibiting the release of acetylcholine at the presynapic membrane of nerve terminals and resulting in muscular flaccid paralysis (12). 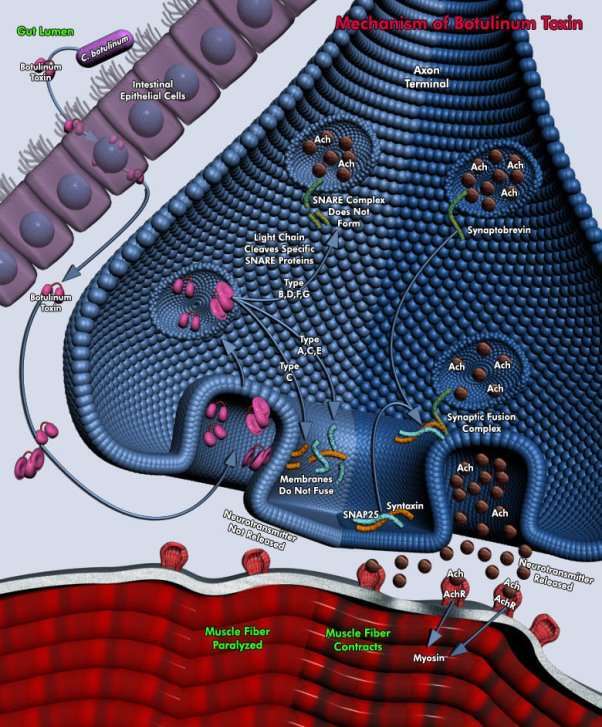 The diagram above shows that the botulinum neurotoxin, which is one of the most potent toxins, inhibits neurotransmitter release at the neuromuscular junction. The toxin is a microbial product synthesised by an anaerobic, gram-positive, spore-forming bacteria Clostridium botulinum whose natural habitat is soil. The toxin which is a zinc-dependent protease, cleaves one or more of the fusion proteins by which neuronal vesicles release acetylcholine into the neuromuscular junction (14). This above picture shows the Clostridium botulinum which is rod-shaped bacteria, under a scanning electron microscope (13). 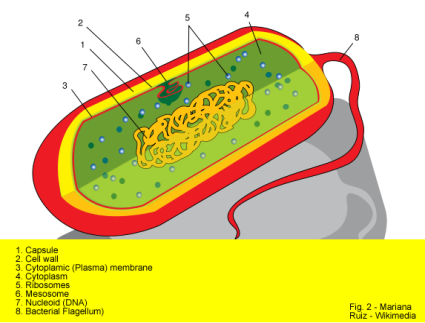 And the below picture is the labelled diagram for bacterium (15). There are many histories of outbreaks of the foodborne botulism. According to the Centres for Disease Control and Prevention (CDC), foodborne illness affects an estimated 48 million people each year, resulting in 128,000 hospitalizations and 3,000 deaths (5). Foodborne botulism comes from eating contaminated foods. The suspected people are often home-canned foods whose preparers have failed to follow proper canning methods, and other sources come from unsuitable handing during manufacture (5). There were eight cases of botulism have been reported to CDC from Indiana (2 cases), Texas (3 cases), and Ohio (3 cases). The illness attack dates range from June 29 to August 7 in 2007 (2). All eight persons were reported to have consumed hot dog chilli sauce made by Castleberry’s Food Company (2). The two cases in Indiana happened in two persons who shared a meal that contained Castleberry’s hot dog chilli sauce the day before the illness attack (2). The three cases in Texas occurred in two siblings and their mother (2). Before the siblings became ill, their mother shared a meal which contained Castleberry’s hot dog chilli sauce. The three Ohio cases arose in unconnected persons who ate Castleberry’s hot dog chilli sauce in the week before illness onset (2). One person reported consuming the chilli sauce in early August, after the product was recalled (2). From the patients’ refrigerator, the hot dog chilli sauce was collected, and the botulinum toxin in the hot dog chilli sauce was identified in patients’ sera and leftovers (2). In accordance with the Office of Rare Diseases (ORD) of the National Institutes of Health (NIH), botulism food poisoning is listed as a ‘rare disease’ (10). It means that botulism food poisoning affects less than 200,000 people in the US population. The incidence of botulism is low, but it is a considerable concern due to its high mortality rate if treated immediately and properly (10). An average of 110 cases of botulism is reported annually in the United States, and 25% of it was foodborne botulism (10). Outbreaks of foodborne botulism involving two or more persons occur most years and commonly caused by eating contaminated home-canned foods (10). Foodborne botulism transmission happens when a person eats food contaminated with botulinum spores, and the spores grow into bacteria and produce toxins in the food (1). C. botulinum is an anaerobic bacterium (6, 11). It means that it can only grow in the absence of oxygen, so the growth of the bacteria and the formation of toxin occur in products with low oxygen content and certain combinations of storage temperature and preservative parameters (11). C. botulinum does not grow in acidic conditions, so that the toxin does not form in acidic foods, nevertheless a low pH does not degrade any pre-formed toxin (11). Many people can be poisoned by consuming contaminated food from the same source, so it can be especially dangerous. The food usually associated with botulism contain improper home-canned foods with low acid content, for instance, asparagus, green beans, beets and corn, and lightly preserved foods like fermented, salted or smoked fish and meat products (6). Moreover, ready-to-eat foods with low oxygen-packaging is more frequently contained in botulism, because although spores of C. botulinum are heat-resistant, the toxin produced by bacteria growing out of the spores under anaerobic condition (11). The typical symptoms of botulism contain double vision, blurred vision, dropping eyelids, slurred speech, difficulty swallowing, dry mouth, and muscle weakness (3). In foodborne botulism, symptoms generally begin 18 to 36 hours after a contaminated food, but they can occur as early as 6 hours or as late as 10 days (3, 4, 8). Early symptoms are marked fatigue, weakness and vertigo. By this time there’s also difficulty swallowing or speaking, dry mouth, facial weakness on both sides of the face, blurred or double vision, dropping eyelids, trouble breathing, nausea, vomiting and abdominal cramps, and paralysis (7, 11). The paralysis may make breathing difficult (11). Then, the neurological symptoms begin to appear the muscles slowly shut down, starting with the temple and forehead and proceeding slowly down both sides of the body (4). The arms and legs slowly get weaker, and diarrhoea is replaced by constipation (4). In addition, there is no fever and no loss of consciousness (11). The paralysis and respiratory failure that happens with severe botulism may require a patient to be on a breathing machine which is a ventilator for weeks or months, furthermore intensive medical and nursing care (3, 4). There are some methods of treatment for the foodborne botulism. Botulism can be treated with a medicine to fight the bacteria which called botulinus antitoxin (9). It blocks the action of toxin circulating in the blood (3). An antitoxin is available to neutralise botulin, but the antitoxin needs to be managed as soon as possible after diagnosis, because the medication cannot repair nerve endings which are already damaged (4). If the paralysis is complete, antitoxin can prevent worsening and shorten recovery time (3). Physicians may try to remove contaminated food still in the gut by inducing vomiting or by using enemas (3). Wounds must be treated, normally surgically, to remove the source of the toxin-producing bacteria followed by management of appropriate antibiotics (3). Supportive care is provided to anyone with botulism, and thus may contain hospitalization, use of a ventilator to help with breathing, and nursing care (4). Prevention of foodborne botulism is based on good practice in food practice in food preparation, particularly preservation and hygiene (11). The US Department of Agriculture and county extension services recommended to the people who do home canning that they should follow strict hygienic procedures to reduce contamination of foods, and carefully follow instructions on safe home canning containing the use of pressure canners or cookers (3). The botulism toxin is destroyed by high temperatures, so oils infused with garlic or herbs should be refrigerated (3). Potatoes which have been baked while wrapped in aluminium foil should be kept hot until served or refrigerated (3). Moreover, people who eat home-canned foods should consider boiling the food for 10 minutes before eating it to ensure safety (3). In detailed, preserved food should be heated to a temperature above 100 (212 ) for at least 10 minutes during the canning process (4). You should not eat or store cooked foods which have been at room temperature for 4 hours or more (4). In conclusion, public education about botulism prevention is an ongoing activity (3). Information about safe canning has to be more widely available to consumers. People in state health departments and at CDC, who are knowledgeable about botulism, should consult with physicians. As antitoxin is needed to treat a patient, it has to be quickly investigated. Physicians have to report suspected cases of botulism to their state health department instantly. Arthur, S. (n.d.).Botulism Transmission. [online] eMedTV: Health Information Brought To Life. Available at <http://diseases.emedtv.com/botulism/botulism-transmission.html> [Accessed 7 Feb. 2015]. Cdc.gov, (2007).Clostridium botulinum Outbreak | CDC Botulism. [online] Available at <http://www.cdc.gov/botulism/botulism.htm> [Accessed 7 Feb. 2015]. Cdc.gov, (2014).CDC – Botulism, General Information – NCZVED. [online] Available at <http://www.cdc.gov/nczved/divisions/dfbmd/diseases/botulism/> [Accessed 7 Feb. 2015]. Chealth.canoe.ca, (2015).Botulism – Causes, Symptoms, Treatment, Diagnosis – Infection – C-Health. [online] Available at <http://chealth.canoe.ca/channel_condition_info_details.asp?disease_id=21&channel_id=1020&relation_id=71085> [Accessed 7 Feb. 2015]. George, K. (2013).13 Worst Foodborne Illness Outbreaks in Recent U.S. History. [online] Healthline.com. Available at <http://www.healthline.com/health-slideshow/worst-foodborne-illness-outbreaks> [Accessed 7 Feb. 2015]. Health.gov.on.ca, (n.d.).Botulism – Diseases and Conditions – Publications – Public Information – MOHLTC. [online] Available at <http://www.health.gov.on.ca/en/public/publications/disease/botulism.aspx> [Accessed 7 Feb. 2015]. Mayoclinic.org, (2014).Botulism Causes – Diseases and Conditions – Mayo Clinic. [online] Available at <http://www.mayoclinic.org/diseases-conditions/botulism/basics/causes/con-20025875> [Accessed 7 Feb. 2015]. Nhs.uk, (2014).Botulism – Causes – NHS Choices. [online] Available at <http://www.nhs.uk/Conditions/Botulism/Pages/Causes.aspx> [Accessed 7 Feb. 2015]. Nytimes.com, (2012).Botulism – Symptoms, Diagnosis, Treatment of Botulism – NY Times Health Information. [online] Available at <http://www.nytimes.com/health/guides/disease/botulism/overview.html> [Accessed 7 Feb. 2015]. Rightdiagnosis.com, (n.d.).Prevalence and Incidence of Botulism food poisoning – RightDiagnosis.com. [online] Available at <http://www.rightdiagnosis.com/b/botulism_food_poisoning/prevalence.htm> [Accessed 7 Feb. 2015]. Who.int, (2013).WHO | Botulism. [online] Available at <http://www.who.int/mediacentre/factsheets/fs270/en/ > [Accessed 7 Feb. 2015]. Btxa.com, (2011).BTXA. [online] Available at <http://www.btxa.com/discover/whatis.php> [Accessed 8 Feb. 2015]. Microbewiki.kenyon.edu, (n.d.).Clostridium botulinum neu2011 – MicrobeWiki. [online] Available at <https://microbewiki.kenyon.edu/index.php/Clostridium_botulinum_neu2011> [Accessed 8 Feb. 2015]. Qiagen.com, (n.d.).QIAGEN – GeneGlobe Pathways – Mechanism of Botulinum Toxin. [online] Available at <http://www.qiagen.com/kr/products/genes and pathways/pathway details.aspx?pwid=285> [Accessed 8 Feb. 2015]. www4.ncsu.edu, (n.d.).Chapter 10. [online] Available at <http://www4.ncsu.edu/~lagillen/SSC 532/Chapter 10/Chapter 10.html> [Accessed 8 Feb. 2015]. "Food Borne Botulism Causes." UKEssays.com. 11 2018. All Answers Ltd. 04 2019 <https://www.ukessays.com/essays/biology/causes-food-borne-botulism-6634.php?vref=1>. "Food Borne Botulism Causes." All Answers Ltd. ukessays.com, November 2018. Web. 26 April 2019. 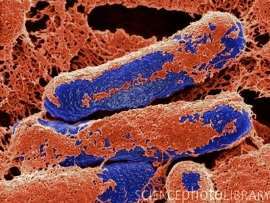 <https://www.ukessays.com/essays/biology/causes-food-borne-botulism-6634.php?vref=1>. UKEssays. November 2018. Food Borne Botulism Causes. [online]. Available from: https://www.ukessays.com/essays/biology/causes-food-borne-botulism-6634.php?vref=1 [Accessed 26 April 2019]. UKEssays. Food Borne Botulism Causes [Internet]. November 2018. [Accessed 26 April 2019]; Available from: https://www.ukessays.com/essays/biology/causes-food-borne-botulism-6634.php?vref=1.